Hip hop is alive and well in Pacific Northwest. Having undergone a break out childhood and adolescence where it tried on lots of personas the art form has grown up, had kids and is now figuring out what to do with the rest of its life. 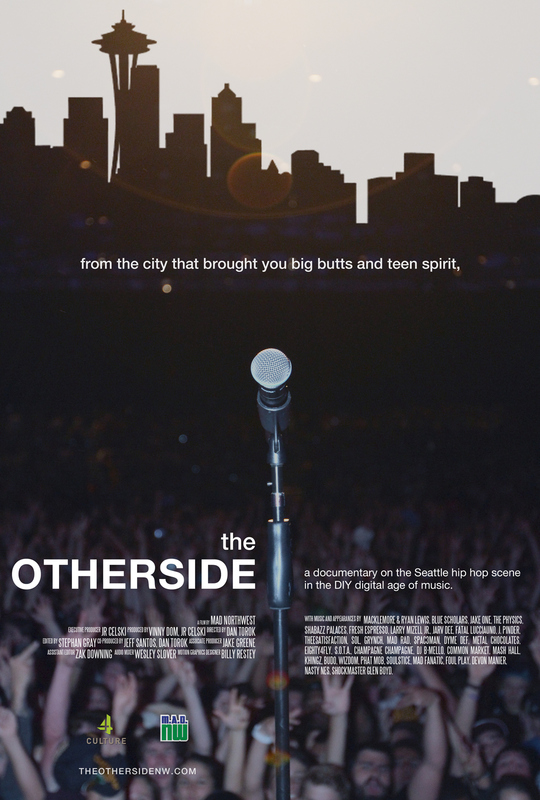 That's roughly the message that the made in Seattle documentary The Otherside opens with before jumping into a whirlwind tour of the state of the "scene." Clocking in at a brisk 47 minutes director Daniel Torok must have been faced with a variety of choices in the editing room. What makes it onscreen demonstrates the unrealized potential for a fantastic film. What's there as exhibited at SIFF will likely be a hit with fans already deeply enmeshed in the genre. But frankly I'm hoping he'll go back and flesh things out for the rest of us. I'm definitely up for a return viewing under those circumstances. What follows comes from a point of love - I hope it's taken that way. First the good. The filmmaker appears to have fantastic access to some very interesting people working to live their dream, at what appears to be a unique moment of inflection in the music industry. The way things are going it's harder to hit that huge mega stardom and riches from selling your songs. On the other hand the record labels that have historically optimized themselves to separate an artist from their full earnings have been weakened. The Internet has wrought an entirely new way to connect with fans and earn a living. Arguably with less of a tournament winner take all economic model - though perhaps one where a higher number of folks can earn a living through their art due to connecting with fans and market segmentation. Broad access to a local music scene creates opportunities to tell a story that wasn't possible some years ago. And concentrating across a range of acts in a single genre gives one the possibility of skipping many of the almost unavoidable cliches of the backward looking doc of an influential band of yesteryear. So ... We've got access to a compelling set of characters at an interesting point in time. Those are the keys to a great documentary. Add to that great footage and solid technical execution of The Otherside. What's not to love? The problem for those unschooled in Seattle hip-hop is pretty basic. Lots of background is left out and one theme is expounded on in a manner that weighs way too heavily on telling rather than showing. Less people saying over and over that the Seattle sound is that we don't have a specific sound. There are lots of quick clips of performances. Letting those play out in a way that audience members can clearly see the differences would be far more convincing. Hip-hop isn't the music genre I know best. So perhaps I need more convincing. I could see strong stylistic differences. But most audiences I'd recon would benefit from more onscreen music that's edited to demonstrate the musical omnivores Seattle audiences are said to be. In case I'm being too subtle let's put this another way. If you made up a drinking game premised on drinking a shot anytime someone said "we have no sound" anyone short of an alcoholic would end the movie in the ER. That said - I am pleasantly impressed no one uttered the rock doc bingo phrase "I'm not into labels." Perhaps I'm just showing my age though. More background on the sub-genres being mentioned. Maybe with a bit of history thrown in - the music doc animated history section has become popular for a reason. I'm left guessing what the differences are between the tons of sub-genres briefly mentioned onscreen. Some are pretty obvious (gangster rap) but even someone I know who is a fan of hip-hop wasn't able to illuminate me on "backpack" style. Expand the view out to other things that might be unique to the northwest scene. Or at least throw a bit of screentime to the local fans. There's mention in passing how club infrastructure has improved. That might be part of it. But I'm not 100% sure and was itching to learn more. Macklemore - more or less, either might work better. He's hard to ignore as the local boy made good. From what I read and what I hinted at it seems there's a lot more to talk about here. An issue with overindulgence is mentioned along with a single comment that suggested he may have taken some time off before hitting it big. In for a penny in for a pound I say. Either cover this in more depth of don't go there. It's almost as if the filmmakers got an extremely great bit of Macklemore being introspective on film. But then didn't support it within their storyline. Not to mention Macklemore's reduced dependence to breakthrough on traditional distribution was untouched even though it's likely instrumental to the hopes and dreams of many profiled. That would've been great to expand on. Especially as the moments when local artists answered questions about how long they could go without being able to financially support their families were some of the most heartfelt. The good news is that at 47 minutes a bit of reorganization and possibly new footage could turn this into a tight and insightful 80 minutes. I hope that's in the cards for the future. The blood sweat and tears of those documented deserve it if at all possible. In the meantime even if that never happens if you're into the Seattle scene shown I'm sure you'll get a kick out of it nonetheless.